25th April marks the first anniversary of the Gorkha earthquake in Nepal, undoubtedly the most important landslide-generating event of 2015. According to ICIMOD, the earthquake triggered 5,159 significant landslides in 14 districts. Of these, 464 landslides directly impacted physical infrastructure. The earthquake killed over 9000 people, with 255 still missing. Many of this latter group are likely to have been killed by landslides. The most dramatic and significant landslide was the Langtang rock and ice avalanche, which was probably the earthquake triggered event that killed the most individuals. I featured a very preliminary analysis of this event back in May based on the initial satellite imagery that was available at the time. Since then the USGS have published an exceptionally useful review of the types and impacts of landslides in the Gorkha earthquake (Collins and Jibson 2015), which includes a description and analysis of the Langtang rock and ice avalanche. The report can be downloaded from here, and there is a set of accompanying (and very useful) videos on youtube as well. The helicopter reaches the site after about 6 minutes, and then overflies both the glacier and the landslide deposit. 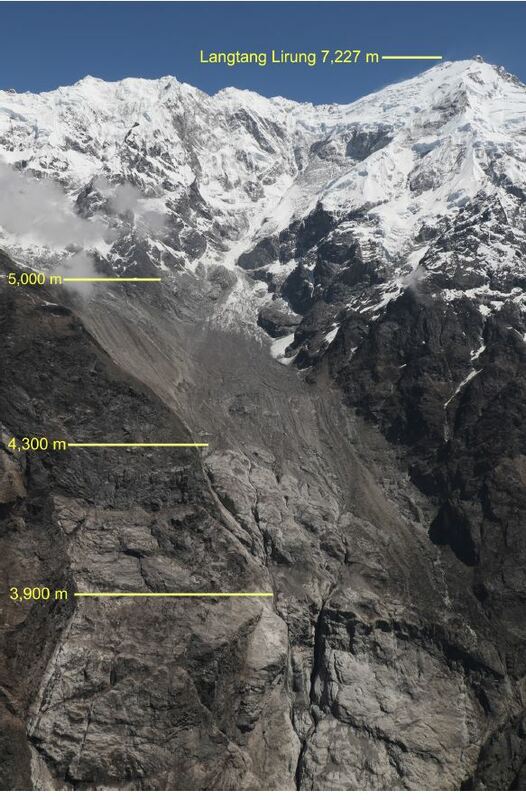 Although the exact location of the uppermost source is difficult to identify, the landslide appeared to initiate at an elevation above 5,000 m on the flank of Langtang Lirung, a 7,227-m-high peak on the north wall of the valley (fig. 19). Large masses of glacial ice broke loose from multiple source areas during the earthquake shaking, and as the ice rapidly descended the steep slopes above the valley it entrained a mixture of rock and soil from the ground surface and surrounding valley walls. The mixture of ice, rock, and soil accelerated down an approximately 35° slope and then became at least partially airborne at a point 500 m above the valley floor where the slope steepens to about 50°–55°. The map distance from the crown of the landslide to the distal tip of the deposit was 3,700 m. The total vertical drop over that length was at least 1,850 m. The deposit covered an area 400 m wide by 900 m long. A preliminary estimate of the total volume of the deposit (based on depth estimates in different parts of the deposit made during our ground investigation) is 2,000,000 cubic metres. We estimate that more than half of the deposit was ice; the remainder was a mixture of soil and rock fragments in roughly equal proportion. The landslide killed over 200 people in the village of Langtang, which was, with the exception of a single dwelling, destroyed completely. The village would have been strongly shaken by the earthquake, then hit by the air blast before being over-run by the rock avalanche. Once again the destructive and under-appreciated nature of earthquake-triggered landslides is clear. That makes sense to me. Initial photos looked like the village had literally been blown away: There was very little apparent deposition. Nothing remained but foundations.